Hello everyone and welcome to my final entry in the Tim Atax PAX series. PAX East has come and gone and I feel much richer for having been in attendance. It was incredible to be apart of something that speakers to gamers in a way that no other convention or event does. Despite my nonstop appointments, long days and guilt about not being able to see absolutely everything the show had to offer I did in fact have a blast attending and covering PAX East for all the CG Magazine readers. I hope that you enjoyed my coverage, contests and tweets from this past weekend. I did it all for you the readers. In the future you can look forward to more great content from PAX in the form of developer interviews, previews and many more articles that will appear in Comics & Gaming Magazine and on cgmagazine.ca over the coming weeks. I would also like to thanks all the PR companies, developers, publishers, and everyone else who took the time to answer my questions and give me and our readers some insight into the games they are working on. For all this I thank you. 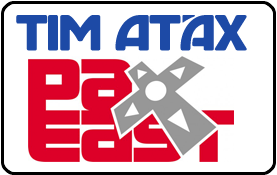 Now it’s time to stoke some egos, so let’s move on to the Tim Atax PAX Best of Show Awards. These awards come with no cash value, just bragging rights, and are based on my observations alone. With plush carpet, great swag, massive statues of our heroes from Borderlands 2, and a full size post apocalyptic bus, the amount of detail in 2K’s massive booth was astounding. Not only did they have a great layout but the environments created for both Borderlands 2 and Spec Ops: The Line were very impressive and really got fans into the experience. Two of the game’s playable classes were available in the demo. I chose the Siren Maya and proceeded to phaselock and shred my way through the Caustic Caverns. On top of that I was given 15 skill points to spend so that I could customize my character and get a feel for some of the new abilities. The game looked great, played really smoothly and not once did I see it crash or stutter. It was stable, fun and really gave me a taste of that sweet sweet Borderlands honey. I’m sure it was the highlight of the show for many gamers. The Riot Games booth would also a contender for loudest booth, if such a category existed. Not because of the music they were playing but because of the screaming League of Legends fans. Every time I was anywhere near this booth there were people going nuts inside it. With giveaways, tournaments, pro demos, and lots of dance contests the Riot Games booth was so bananas that PAX Enforcers were constantly in there trying to keep fans from spilling out the aisles. 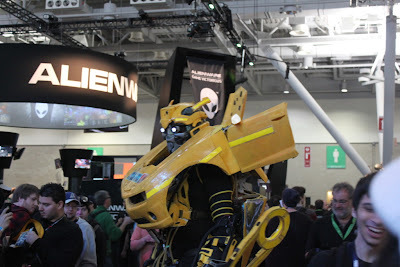 This person’s costume was so massive that they required a permanent PAX Enforcer with them at all times. The costume was about 9 feet tall and incredibly detailed. I can’t even say for sure that the thing didn’t actually transform but it sure looked like it could transform and roll out at any moment. Runner up: Guitar playing Link. Assassin’s Creed III may not have been playable at PAX East but that didn’t stop Ubsoft from stoking the fires on my hype train. Behind closed doors I experienced a 10 minute gameplay video that not only convinced me that this could possibly be the best Assassin’s Creed yet but it could also be Ubisoft’s best game to date. We’ll have to wait until the fall to find out for sure but from what I saw, my hopes shall remain high. It is with great pride that I bestow this honor upon a local developer from right here in Toronto. Guacameele is a colourful, wonderfully hilarious side scrolling brawler that had me and any other journalists I spoke to buzzing. Great job guys, I can’t wait untl this one comes out. Interviewing Suda 51 CEO of Grasshopper Manufacturer. I can no longer say that I’ve never done an interview with a Japanese game developer. Also how awesome is it that my first Japanese developer interview was with none other than Suda 51 one of the most unique minds in the industry. It brought a giant smile to my face when he told me that he was impressed that I’d traveled 10 hours by car just to be there. Doumo arigatou Suda-san. Runner up: Meeting Jeff Green and Shane Bettenhausen. Again, massive thanks to you to everyone who made my weekend in Boston amazing. I especially want to thank Eric Moon and Kenickie Street for traveling with me, sharing the driving, and sharing my hotel room. Your company made this trip extra awesome and from the bottom of my heart I thank you.